There is no doubt that Recycled Plastic building materials have come of age. New building regulations require the use of materials with a reduced carbon footprint such as recycled plastic lumber. In addition, recycled plastic lumber does not rot, crack or splinter, is impervious to moisture, frost proof and UV resistant. It lowers the maintenance costs of housing stock to the point where initial outlay is recouped in 2-5 years. Buy yours here. Used for marking out borders and/or building projects. These recycled plastic Edging Board Pegs will not rot once installed into the ground, so you can leave them in for as long as you wish. Recycled Mixed Plastic 75 x 50mm can used for many building and construction applications instead of wood such as studding in damp or wet conditions or as a DPC. Will never rot. Technical spec available. Install once only and never treat or replace it again. Maintenance-free bliss. Also suitable for dunnage and stillage applications. Used for battens, lawn edging and general building applications. Handles like wood, performs like plastic. No rot, no splinters, maintenance free and lasts a lifetime. Available in lengths 800mm - 2800m. Ideal Fencing Material. This Recycled Plastic Plank 150 x 50mm is used often for the seats and tops of benches and picnic tables, general building use and landscaping. Will not rot, warp, crack or splinter and will last a lifetime with no maintenance required. Avaialble in Brown and Grey and a variety of lengths. An tough, robust, sturdy profile that is guaranteed to last 25+ years. Available in Brown and Grey and 1m - 2.8m Length. Tough, Long Lasting and Cost saving - what more could you want? 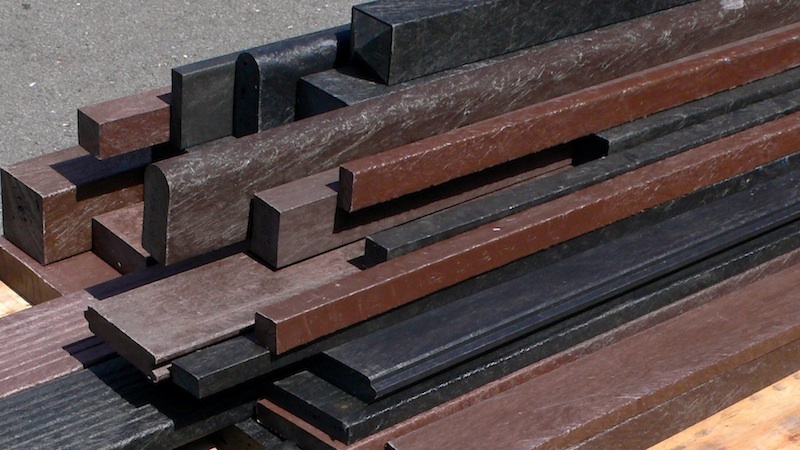 Recycled Plastic Square posts are designed to maintain themselves so you don't have to. Available in Brown and Grey and lengths 800mm - 2800mm. Suitable for many construction applications such as joists and bench slats. Will not rot or deteriorate. Highly robust. 100% Recycled and recyclable. Our Boards/Container Levellers will out-perform and out-last any treated timber alternative. Available in 3 different lengths. Great Slip-Resistant, Water Proof Decking. Available in Brown and Grey, and in various sizes. Ideal for Heavy Outdoor Use. Available in Brown and Grey, and Lengths 3.5m - 6m. Waterproof and Extremely Robust. Available in Brown and Grey, and Lengths 3.5m-6m. Very large, heavy-duty recycled plastic piles. Available in Brown and Grey and Length 2000mm - 2900mm. Extremely rigid and maintenance-free. Ideal for paddock rails.